Should a trigger finger always be operated? Are there other options besides surgery or injection? What medications are used in the treatment of a trigger finger? What else can I do to avoid surgery? How does the cortisone injection performed? What side effects should be considered in cortisone injection? I believe that is the reason why the acceptance of cortisone injection varies considerably from patient to patient. Many trigger fingers (or trigger thumbs) in adults can be successfully treated without an operation! There are surgeons who considered conservative treatment of trigger finger or thumb as unreliable and longstanding. In my view operation of a trigger finger is the ultimate and not the first choice. Of course: operation of a trigger finger ist a relatively simple surgical procedure usually done outpatient and under local anesthesia. But the operation is connected with a small but significant risk of complication. Operation of a triger finger is also the most expensive and painful option and is often not necessary for resolution of symptoms. First of all: Avoid repetitious gripping! Avoid the use of power tools, music instruments, gardening, golf, tennis…. Please do not make a mistake. A hard object in the hand – -for example a tennis ball — is contra productive, because the ball is pressing to the pulley. Particularly, if the triggering is in an early stage, the warm hand bath is highly successful. An other option is to splint the involved finger! Some patient report relief of pain if they massages serveral times throughout the day the affected finger. The combination of warm hand bath an massaging the finger is especially helpful. If symptoms like swelling and pain are disturbing an anti inflammatory medication may be considered. Such nonsteroidal anti inflammatory drugs (NSAID) – for example ibuprofen, naproxen, diclofenac and others – relieve often pain and swelling. In some cases the diminishing swelling and inflammation is reason for a better gliding of the tendon and less snapping. I recommend use these drugs – particularly over a longer time – never without consultation with your doctor. Keep in mind: These drugs have a variety of side effects (for example: stomach bleeding or ulcer). Steroid injection is very successful in the treatment of a trigger finger or thumb. Injection with a corticosteroid is effective over weeks to months in more than half of patients with a trigger finger or trigger thumb. The left figure shows steroid injection to the tendon-sheath of the thumb at the level of A1-pulley. 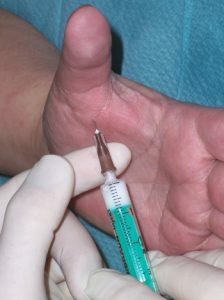 The cortisone is injected in the tendon sheath or near the tendon sheath. (Not into the tendon). Local infiltration of cortisone inhibits inflammation and reduces swelling. It restores smooth tendon gliding through the pulley. This treatment is particularly effective when applied shortly after the first symptoms begin. Sometimes, injection had to be repeated. I repeat personally cortisone injections but not more than 3 times. In general: cortisone injections are less effective in patients with other medical conditions like rheumatoid arthritis or diabetes.